The term "bucket list" is a popular one these days ... the idea is to create a list of things that you absolutely must do before you kick the bucket, and then get to work on actually doing those things. I think it's a great concept, and I have a mental bucket list that's a mile long. I decided to head out yesterday to check one of the Montana-related items off my bucket list, and I'll report on my destination tomorrow after I've gone through the photos. 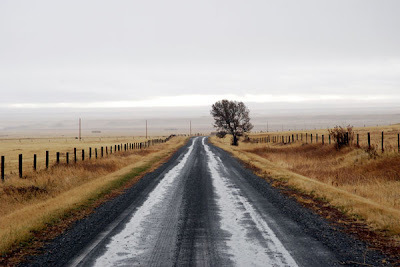 This is a shot I took on the drive up ... a rainy day on the Geyser Cutoff Road. A gorgeous and thoroughly-Montana drive, but the Choteau County road crew really needs to dump some gravel up there! OMG...looks almost like the road to Shonkin...LOL I turned around shortly after reaching a similar tree. We Headed Them North might be more of a guy thing, too, but I'll be interested to see what you think. I saw that quilt book at the History Conference ... while it's not quite my interest, it's a very handsome volume, and pretty reasonably priced considering its size and all the color photos. And I didn't know you had a blog! (Silly me, for not even looking ...) I'm off to take a look now. ROFL...geez Mark, I'm all over the web...derelict blogsites R us...it's how I amuse myself in winter. Ran into some photos in Flickr...a Montana set by a fellah name Marc Rettig = mrettig GOOD stuff if you're surfing around. nice shots from around Shonkin. And speaking of Shonkin -- a friend was telling me about some really interesting old Finnish-American homesteads up in the Highwoods, that are on the National Register of Historic Places. Ever heard of them? "really interesting old Finnish-American homesteads up in the Highwoods"
No, I've not heard of them but know there's a goodly number of Finns out this way, and have seen a great many names in old documents. Mother's parents came from Finland before 1900 and married in GF in 1910. Wherever they congregated you'll find remnants of old Saunas, and lots of stories of fierce feuds. There was a colony of Finns over here...near Enaville. Some of those families are still around.